Yesterday I had a stroke of luck. After going to PetSmart to buy Frontline for the cats ($110 for 6 doses, OW), I went to the studio on Wharton St. to fill up the Chevy with what I could get into it. Had to take advantage of my high energy level! Susanne had hired a guy to clean up the yard and I was able to pay him $20 to deliver my shelf units to my house afterwards. Less than it would have been to rent a truck, and much more convenient! So instead of weaving on Cathedral, I spent the rest of the day shifting stuff around. We have a long room at the front of our Craftsman house. It’s a little too narrow to work with very well. At one time we tried to make it our living room, but eventually we moved the sofa, TV, etc. in what was supposed to be our dining room. We never sat at the table anyway – it was a junk collector like our countertops are now. 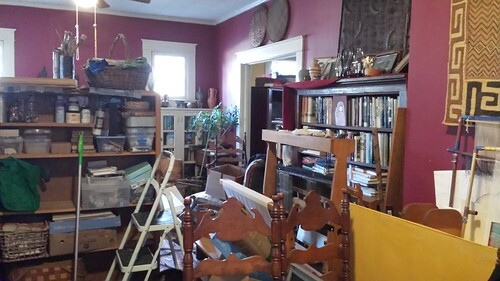 I moved my studio from the back building to half of the front room, and of course it is a mess just like every other place in the house! We decided to put one of the shelf units in the middle of the room like a room divider. 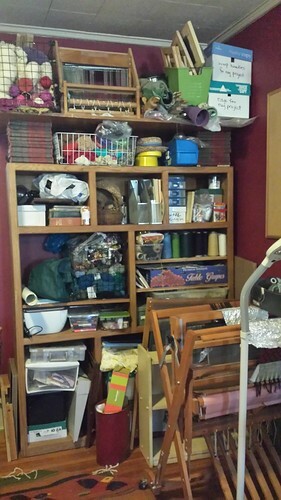 Now that I have more storage in here, I am looking at what you see when you first walk into the space. 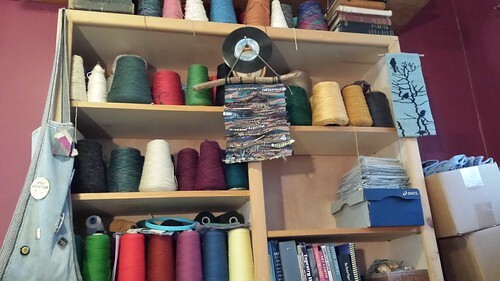 I’m going to move the more attractive stuff like cones of yarn and books to those areas, and try to keep my bookbinding/painting supplies in one area, my weaving and sewing to another. We’ll see how it goes. This may just be a subconscious effort to avoid weaving on Cathedral today, but I’m excited. It’s almost like getting a new studio. What I’d really love to do one day is to get a carpenter to put in wall to ceiling shelves on most of the wall space. I also need much better lighting. Here are some before shots. Keep in mind that some of the junk is boxes to be donated to Reconsidered Goods or recycled. I’m planning to sell the Schacht Baby Wolf loom, but I think I’ll keep the Dorothy loom up high on the shelves so I’ll have a portable one if I ever buy a camper. Here’s what it looks like when you look in the studio when you come in the front door. The basket was made by a dear former friend of mine. 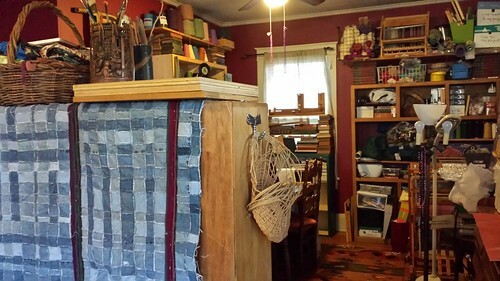 This is looking back at the “new” room divider, my Macomber loom and the other half of the room where the woodstove is. In case you wonder how I keep my tapestry from being destroyed by my cats (and they have damaged the ones I hung on the wall, so they are not on the wall any more), I have found that they hate foil. 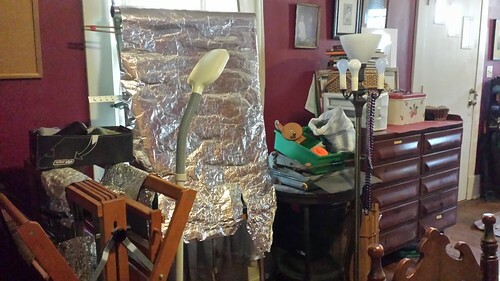 Anything I want them to stay away from, I cover with foil. This is the area I want to make prettier. And here is the view from where I am sitting. I’ll post my tapestry updates later. I need to eat. I forget about that sometimes.